Gap shirt, Children’s Place tie! It’s the season for plaid! December seems especially suited to plaid—maybe because it pairs so well with black velvet?—so Adrienne of The Rich Life (on a budget) and I thought it was perfect for this month’s “How I Wear My” post. This plaid tie belonged to my son when he was 2. I bought it for him to wear in Christmas pictures and because it was his first tie I can’t bring myself to get rid of it. Of course because it’s made for a toddler it’s way too short to wear in a regular way so I thought I’d wear it Duran Duran-style—tucked in midway like Simon and the rest of those fine English foxes did in the video “Is There Something I Should Know?” back in 1983. 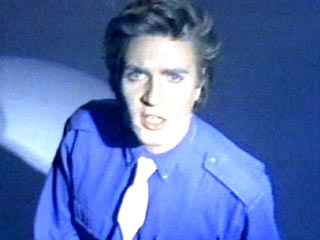 Simon Le Bon of Duran Duran taught me how to wear a tie. I love him for it. When I was 15 and 16 I took many sartorial lessons from Duran Duran, probably more from them (and Madonna) than any fashion magazine! (Completely unrelated side note: I lived in the Philippines at the time and felt like I was in a Duran Duran video since they always shot in such exotic locations. Those guys seriously could’ve filmed a video where I lived and it would’ve looked amazing). Can I just say that self-portraits are hard? I think if I just add a black jacket and my stacked heel black patent loafers to this look I will be ready to hit the town for some (spiked) eggnog and caroling! With Duran Duran! And the gents and I will all wear our ties tucked in! Oh what fun that would be. As long as we can sing “Girls on Film” or “Planet Earth” at some point. After all the glitter and sparkle of the holidays, won’t it be nice to have a fashion palate cleansing? If you want to get back to basics please join Adrienne and me on January 3, 2013 for “How I Wear My: Black & White.” It’s a perfectly simple (yet always chic) way to ring in the New Year! 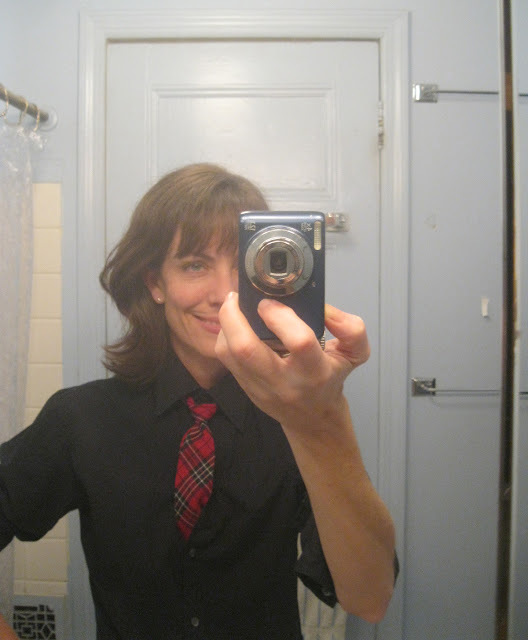 And do head over to Adrienne’s to see how others wear their plaid! I love you in this tie...it is a great look! I am sorry I missed your collaboration..somehow I just did not get it on my calendar....I think my busy, busy month is catching up with me. I hope to join you again for the next one. You look great in this, Jill! I love how you're mixing two of today's popular trends: menswear + '80's fashions. It really works for you...and now I need to find a little boy's plaid tie to wear with my black button-down. Here's to more HIWM in 2013! A perfect way to wear plaid, and I love your hair a bit longer as well. How fun loving is that tie! That + the Duran Duran mention is making me want to dance. Hope you're having a good time in NYC looking at all the holiday windows. I can't wait—hope you still want to meet up. Oh, I LOVE your plaid tie! You look fabulous! How cute is your outfit today! Your son's tie is so awesome! Sorry I couldn't participate....been out of town and really been hectic around here. I love the little plaid tie! Duran Duran! That takes me back. I love your new 'do, and would never have thought to wear a tie that way. Jill- I LOVE LOVE LOVE THIS LOOK! A twist on traditional menswear and fresh and fun- oh plaid is so wonderful as are you. What a great way to use a toddler's tie, and what a wonderful way to fresh up this traditional tartan. I really love this idea! So simple. I'm going to look for some clothing to make one for myself! Thanks for the idea!